We wrapped up the end of the year with the UNC Charlotte University Recreation Center project continuing to show progress. As the concrete trade contractor continued their installation of concrete foundations and retaining walls at the first floor level, they also began work on the second floor of the building. Walls are being waterproofed and prepped for backfill operations. Concrete columns at the west side of the building are also being constructed for the post tension concrete superstructure at the Natatorium/Gym area. Under-slab utility work has begun at the first floor, with the first slab on grade pour scheduled for mid-January. Site work trade contractor is continuing with the installation of underground site storm and sanitary sewer systems. 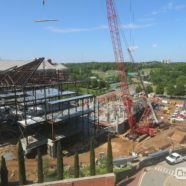 During the month of November, work at the UNC Charlotte University Recreation Center project continues to progress with the concrete trade contractor continuing their installation of concrete foundations and retaining walls at the first floor level of the building. They have also started working their way up the hill to complete a portion of the 2nd floor foundations and retaining walls. Under-slab utility work at the first floor is scheduled to begin mid-December. Site work trade contractor is continuing with the installation of underground site storm and sanitary sewer systems.